The league phase of the Qualifying Round 2014 of the Royceton Gomes Memorial Football Tournament concluded today on the grounds of St. Paul’s High School. The first match at 2:30 PM was played by Dnyan Mandir High School and Phoenix English Medium School. It turned out to be a beautiful bright sunny day. The game began with both teams trying hard to score and Dnyan Mandir putting on a great defence. There were many direct shots at the goal of Dnyan Mandir but the goal-keeper Abhishek Raikar saved them well. No goals were scored in the first half. The second half saw both teams stepping up their game but in the final minutes of the match, Preetam Naragundkar of Dnyan Mandir scored a goal. Dnyan Mandir won the match 1 – 0. The second match of the day at 3:30 PM St. Mary’s High School played against Love Dale Central School. The match began well paced and Mohd. Taif Shaikh of St. Mary’s High School opened the score in the 9th minute. It turned out to be a great match for St. Mary’s as Omkar Shindolkar scored two consecutive goals in the 19th and 24th minutes. Love Dale tried their best to score and defend but it was not enough to stop Mohd. Affan Savanur from scoring a goal in the 39th minute and Omkar Shindolkar from scoring his hat-trick goal of the match in the 43rd minute. St. Mary’s won the match hands-down 5 – 0. In the last and final match of the league phase Bensons High School took on Phoenix Public School. It was a tense and exciting match that kept everyone on edge. Both teams were fighting fiercely to score but both teams had excellent forward and defence lines. The first half was goal-less. The battle continued in the second half but the match was decided by a brilliant goal by Revanna Tolamaradi of Phoenix Public in the very last few minutes of the match. 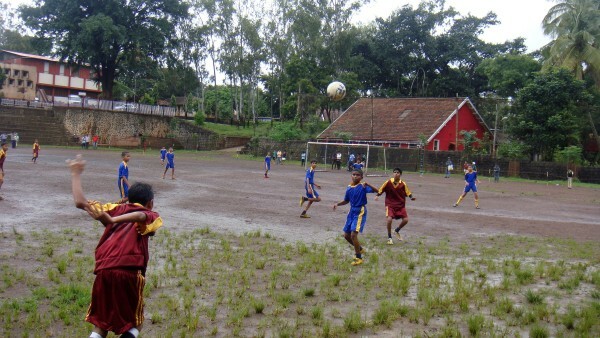 Phoenix Public School won the match 1 – 0. Tomorrow begins the Knock-out Phase of the Qualifying Round 2014 where Dnyan Prabodhan Mandir School will take on Phoenix Public School at 3:00 PM and Sant Meera Eng Med School will play against Dnyan Mandir High School at 4:30 PM. Previous articleWhy Should I Care…..When All do it, I might do it as well!! !